Custom Mini Highlighters Personalized in Bulk. Promotional, Inexpensive. Budget Prices in America. 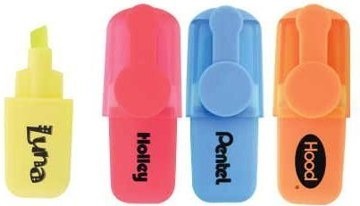 Bulk highlighters with pocket clips, custom imprinted with your logo or message. We also supply wholesale blank (not imprinted) highlighters for $0.65 each. Budget Prices in the USA and Canada for wholesale personalized mini highlighters. American clients pay no taxes. Free artwork design. We will send you a proof for your approval before production. Price includes your 1-color custom imprint. You may order any quantity above the minimum. Setup charge is $45.00 per color. Extra imprint colors: add $0.25 per color, per highlighter, plus an additional $45.00 Setup Charge. Setup Charge: $45.00 per color; Repeat Setup Charge: $22.50 per color. Imprint Area: 1/2"x 5/8" on cap; 5/16" diameter on clip.